Flickr? I hardly know 'er! Like most things, the eggcorn is neither an Easter morning side dish nor an unusually large growth on the bottom of the foot. 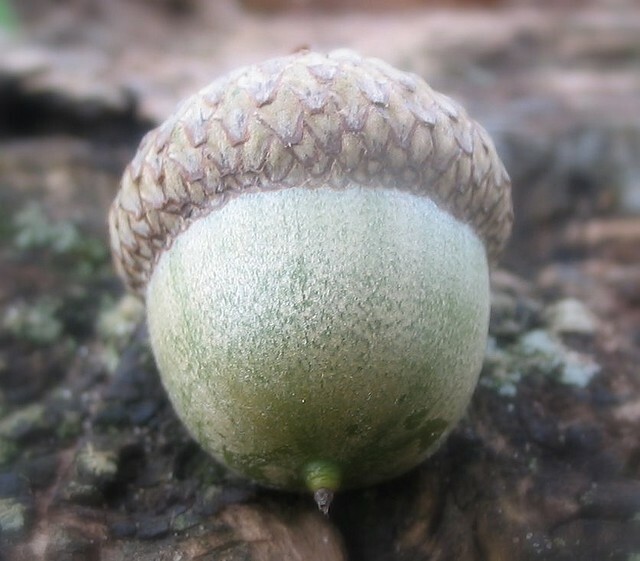 It is a seed, encased in a shell, that falls off trees and provides snacks for passing wildlife. Bear with me, though the eggcorn might seem like a lark—I’m nut oaking. “Eggcorn,” of course, sounds roughly the same as “acorn,” but it’s also a term that linguists coined to describe an apt, if erroneous, linguistic substitution—a malapropism that actually sort of works. For instance, “financial heartship,” or “on the spurt of the moment.” I learned about eggcorns when I was shocked to discover that the phrase “You’ve got another thing coming” is incorrect. Because the clause that traditionally precedes it is “If you think that,” the other thing you have coming is actually another think—an eggcorn because the substitution of thing doesn’t much alter the meaning of the phrase. A University of Pennsylvania linguist called eggcorns "tiny little poems, a symptom of human intelligence and creativity." This sounds complimentary, though it’s odd that the linguist used the word “symptoms”—a neutral term, if you’re going by the dictionary, but also one usually associated with disease. One wonders if deep down he’s one of those pun haters. One evening, a group of carousing students gathered beneath his window and loudly called for him to address them. "You don't want a speech," he answered testily. "You only want me to say one of those things." "This sauce could use some more seasoning," he said sagely. “I sort of have a thing for redheads," she said gingerly. “I like a good sled dog," she said huskily. “This hot dog's awful," she said frankly. "There's an insect in my French cheese," said Tom briefly. A couple years ago the New York Times ran a Tom Swifties competition in the comments section of a blog post. "'Jesus Christ,’ Tom said crossly” was a clear winner.